A rite of passage for any toddler, we’re thrilled to announce this dreamy toy pram from Ooh Noo is now available locally. Treasured teds and dolls will ride in style with this sweet Ooh Noo toy pram made entirely from timber – discounting the rubber tread on the wheels ensuring a smooth ride for passengers (and a quiet one for mum and dad). Its curved crescent shape is truly a sight to behold and the refreshing white and timber finishes gives a contemporary Scandi inspired twist on a classic, much loved toy. 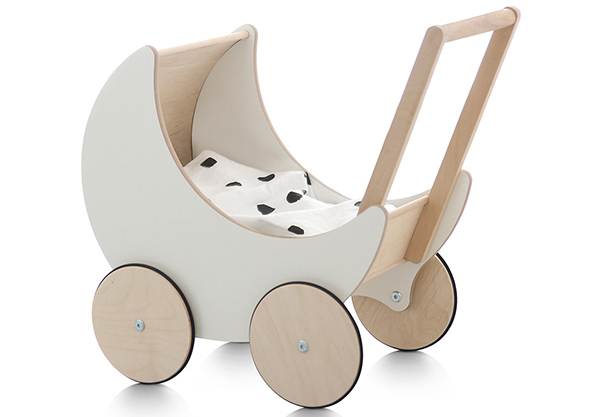 Priced $229.95, the Ooh Noo toy pram is available from Hello Little Birdie.